LAFM: How did this season go for you and your team? Not as well as I hoped. We had to install a new offense that no one was familiar with, and we had a lot of first year starters. We had to learn as the season progressed. We wanted to go farther in the playoffs, but I guess it wasn’t meant to be. LAFM: What was your best game this season, and why? My best game of the season was against our district rivals, St. Martinville. I had a great game. I made numerous big plays on defense, and I even got to get into the game as a fullback. I didn’t run the ball, but I was able to get some good blocks that sprung our back into the end zone . I am 5’11 and I weigh 195 pounds. I wrestle now so I had to drop a couple of pounds to wrestle in my weight class. My football playing weight is 200-205 pounds. Jack Tatum, due to the ferocity of his hits. He once said “I would like to think that my best hits borderline felonious assault.” That guy was a pure hitter. He destroyed ball carriers and receivers alike. I try to copy his style of play, sideline to sideline, no mercy. I was about 7 years old. I started off playing flag football at the Lafayette YMCA. When I was about 10, I played for a city league pee wee football team at Brown Park in Lafayette. If football doesn’t work out, I would like to pursue a law degree. I have always been interested in law. I plan to pursue a criminal justice degree at Southern University. Currently I am being recruited as a strong safety to be used primarily as a nickel back. Some schools are undecided as to how they want to deploy me, as a safety or as an outside linebacker. My favorite position is nickel back. I love to come off the edge hard and wreak havoc in the backfield. Disrupting the offenses timing and knocking the snot out of guys is what I live for. 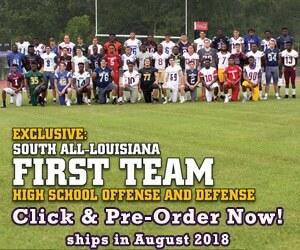 I was getting looked at by North Texas, UL Lafayette, Texas Tech, Nicholls State, Northwestern, LSU, Northwestern, Prairie View, Southern, LA Tech and ULM. I have been on two official visits, and Sunday I gave my verbal commitment to play for Coach Odoms at Southern. My GPA is a 2.4. My Act was a 17. I will retake it in February and am trying to lift up my GPA.